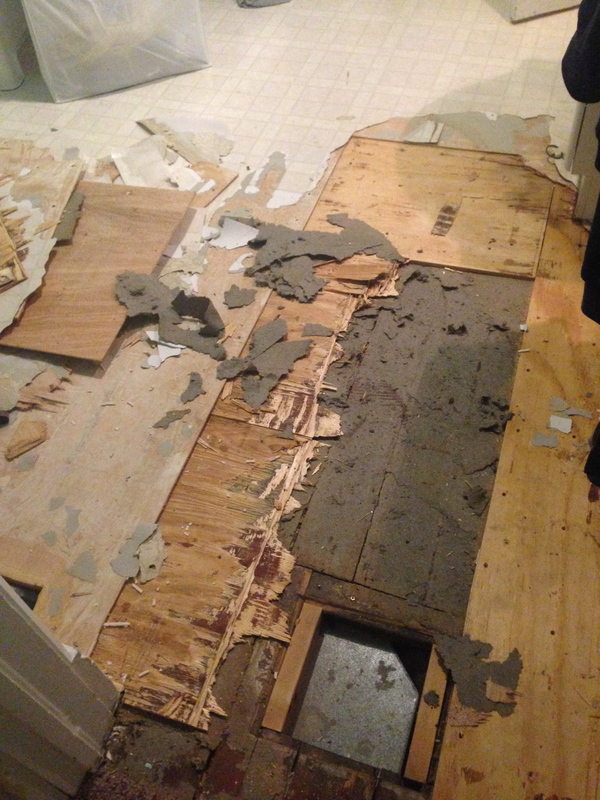 On New Year’s Day, we tore up the plywood underneath the outdated linoleum. 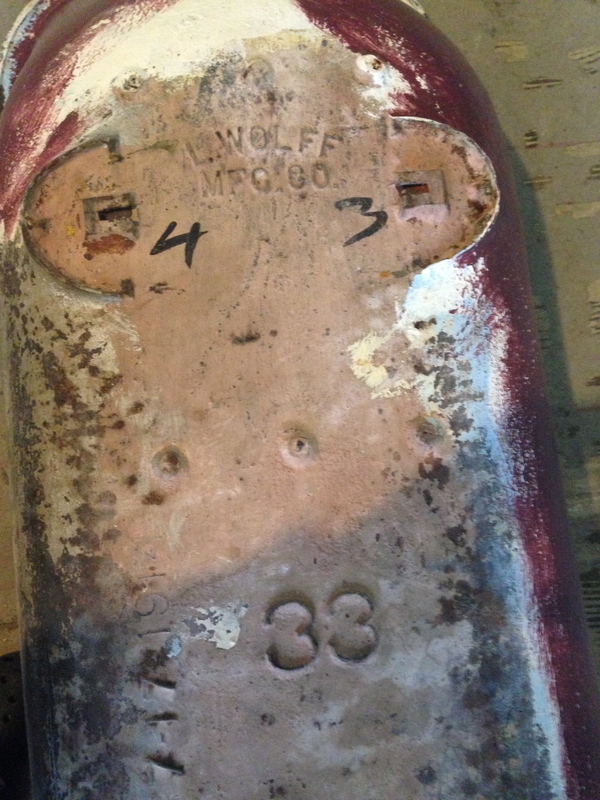 If the original fir floors were in good shape, we were going to try to keep them. 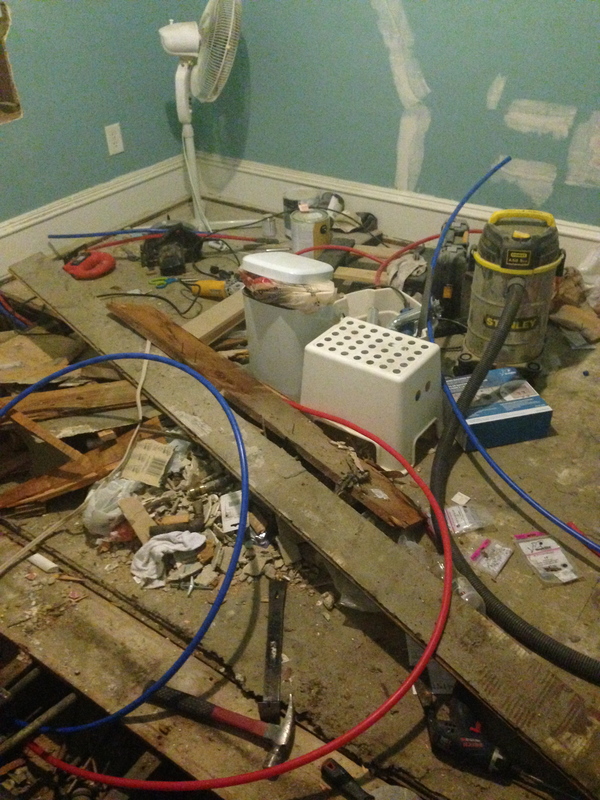 Unfortunately, there are too many wide gaps, and many patches to the original floor, so we are going to tile over them. It’s starting to get real. We now have no way to bathe or shower. Step 3: Uncover something beautiful that inspires you to keep going. 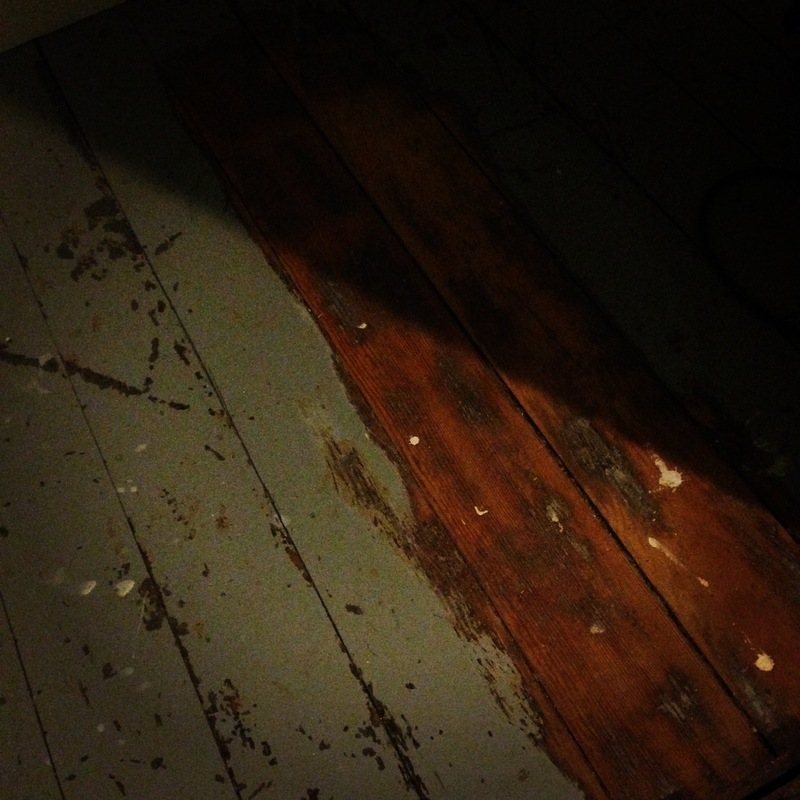 We wanted to be able to have original plank floors somewhere in the room. We decided to do this in the closet, where the original clawfoot tub would reside. It was pretty awesome to sand off the paint (perhaps original, or at least close to it) and see the beautiful fir appear. This is the original tub. It had been hooked up with a shower surround, but my husband h.a.t.e.d it. He’s a tall guy, and it just wan’t working for him. Also, our 3 kids pulled on the curtain, and the the surround was broken. My husband insisted that we needed a regular shower and we began shopping for a traditional tub/shower from a big-box store. 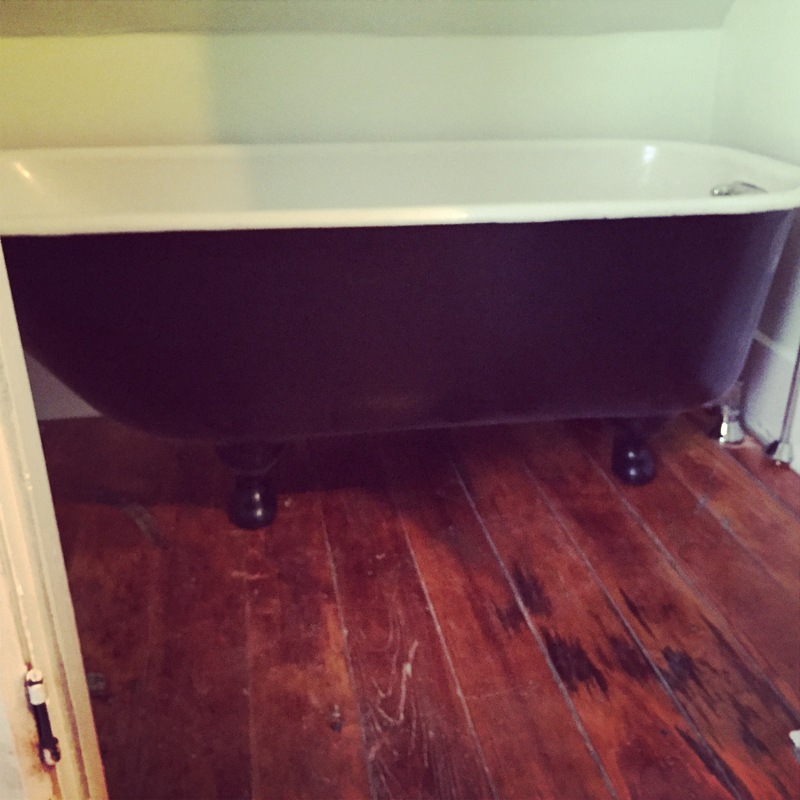 After some intense head scratching, a little whining on my part, and guilt from the restoration gods, who surely did not want me to get rid of the tub… we found a way! The closet! It fits perfectly! How are we going to get it in there? Who cares? We get to keep the tub! 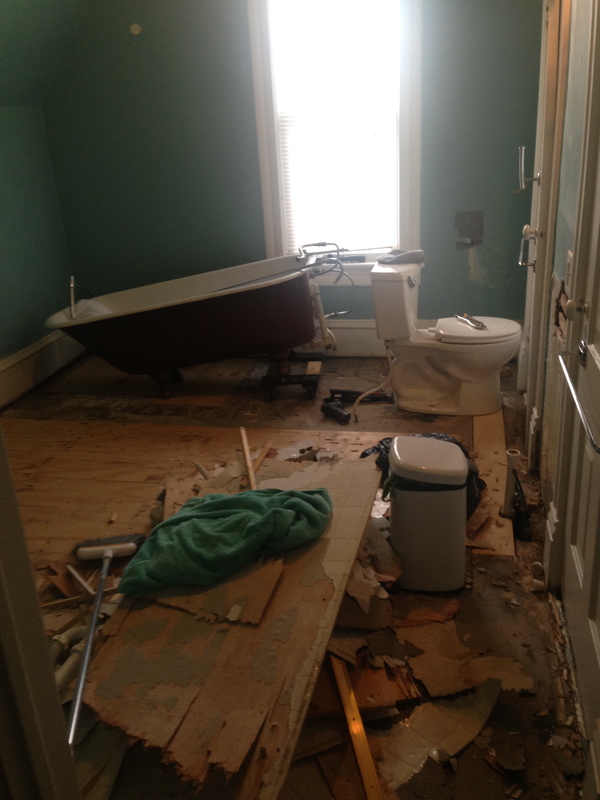 Luckily, the porcelain interior of the tub was in good shape. There is a little rust around the drain that we will address…some day. To repaint the outside of the tub, I found a great product called “ADVANCE” by Benjamin Moore. It is an Alkyd paint/primer that acts oil-based but cleans up with soap and water. I used a blackest-black color in a satin finish. I cleaned the tub with TSP, rinsed, sanded it with coarse sand paper, washed it again, put on one coat, sanded, washed and the gave it a second coat. The feet of the tub were not intricate at all, and I decided to paint them too. I really felt like I wanted a very light, airy, happy green in this room. I didn’t want it to be sagey, but not too neon either. The color I finally went with is called “Cabbage” by Valspar. I could find no one else on the Internet (Pinterest, Google) who has actually painted a room this color, so I might have made the wrong choice. 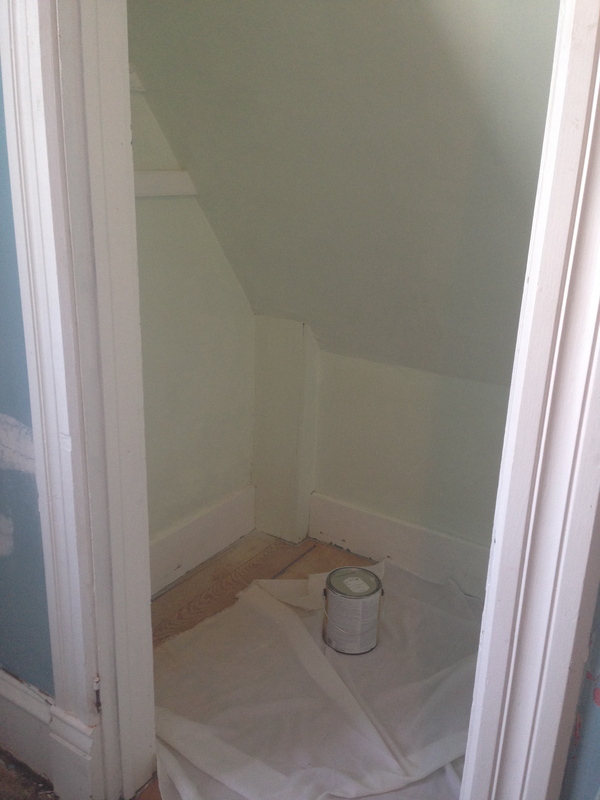 So far, the closet is the only thing we’ve painted, and you can’t judge a color by how it looks in a closet. It’s just not fair. Step 6: Say a prayer that the tub will actually fit in the closet, and rejoice when it does. Promptly bathe stinky children. 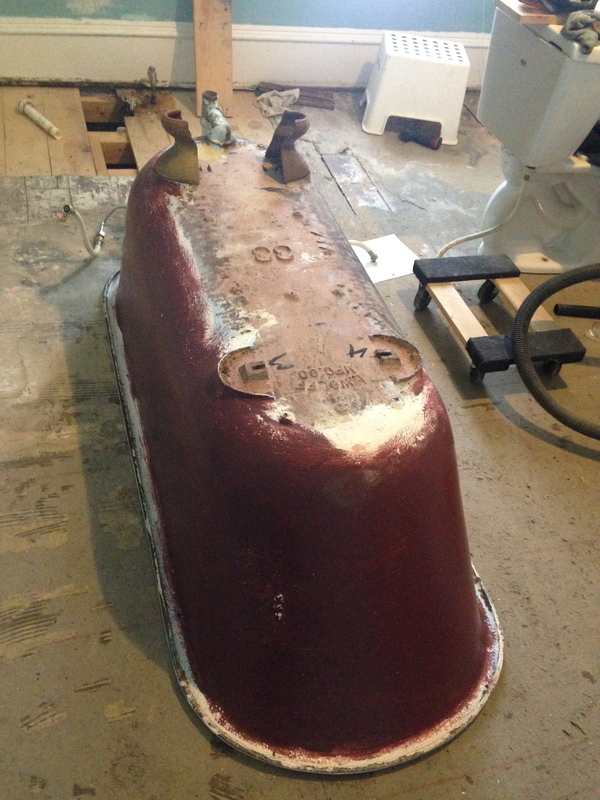 Walls and trim painted, floors given two coats of marine-quality poly, and my husband manages to get the tub in solo! Doesn’t it look amazing!?!?! Step 7: Take in the view from the tub, take a deep breath, and keep on going.